MR. THEIS: Good morning. Thanks to everybody for coming today. I’m David Theis, the World Bank’s Press Secretary. Dr. Kim will give brief opening remarks and will turn to your questions. Just a couple of small housekeeping items if I could, please. First off, if everyone could please remember to silence their mobile phones, of course. When we get to the Q&A if you could identify yourself and your outlet as you get the microphone. Thank you very much. Dr. Kim? DR. KIM: Thank you, David. Good morning and welcome everyone to the 2017 World Bank and IMF annual meetings. This week finance ministers and central bank governors from our 189 member countries are gathering here in Washington to discuss the challenges and opportunities we face as a global community. These discussions will help countries chart the path forward for how to improve the lives of their people— and in doing so, this should help set the agenda for the world’s economy for the coming year. Here’s what we’re seeing now: after several years of disappointing growth, the global economy has begun to accelerate. Trade is picking up, but investment remains weak. We’re concerned that risks such as a rise in protectionism, policy uncertainty, or possible financial market turbulence could derail this fragile recovery. Overall, we’re seeing growth rise in most developing and advanced economies— which is why countries need to make critical investments now. This is the time to implement reforms that are going to insulate against potential downturns in the future. Countries need to build resilience against the overlapping challenges we face today, including the effects of climate change, natural disasters, forced displacement, famine, and disease. To help countries address these challenges we’re working to maximize finance for development. We’re pursuing private sector solutions whenever they can help achieve development goals and reserving scarce public finance for where it’s most needed— particularly investments in human capital. All countries need to invest more in their people. Last week, I spoke to Columbia University, where I explained why this is so critical, and I introduced an accelerated effort that we’re undertaking at the World Bank Group called the Human Capital Project that will help countries invest more— and more effectively— in their people. We’re hoping that this project can show heads of state and finance ministers how long-term investments in their people can help grow economies and it can help create the political space for leaders to make these critical investments. Over the next year leading up to the 2018 annual meetings in Indonesia, we’ll be working with a wide range of experts in economics, global health, and education to develop the Human Capital Project. We think this effort has the potential to be a game-changer in the same way that our Doing Business Report was when it launched 15 years ago. This is the latest effort by the World Bank Group to meet rising aspirations all over the world, to truly create equality of opportunity, and build new foundations in the project of human solidarity. Thanks very much for your attention, and I’d be happy take your questions. MR. THEIS: If we could have the reporter right here up front in the red jacket, please? QUESTIONER: Good morning, Dr. Kim. I’m Qingyun Cao from China Central Television and CGT in America. In each of the past five years, an average of 30 million people were lifted out of poverty in China, especially targeted measures were taken by China’s government to help targeted groups to avoid self-dependence on welfare. How do you look at China’s efforts in this battle against poverty? And my second question is: the 19th Party Congress is going to take place in Beijing very soon, which will set policy priorities for the next five years. What is your expectation on those polices, especially regarding development? Thank you. DR. KIM: Thanks very much. You know, this is one of the great stories in human history, frankly. Starting in 1990 with the evolution of the Chinese economic system and its embrace of the global market, China has lifted over 800 million people out of poverty. So, most of the progress that’s been made in going from 40 percent of the world living in extreme poverty to now less than 10 percent, most of that progress, happened in China. So, we’re always looking for the lessons from that experience, and it continues. We’ve been working very closely with China on things like ensuring that some of the more distant regions in China are also getting access to social services and healthcare. We’re working right now on a major overhaul of the healthcare system— not an overhaul, right now it’s in the form of a pilot project— but if it works out, it could lead to a major change in the healthcare system that would, I think, help to improve outcomes overall. So, this effort has been historic. I think we’re still trying to understand exactly how 800 million people were lifted out of poverty, but it was one of the great successes. In terms of the Party Congress, of course, these are internal Chinese political matters, but I think China has been pretty clear about the direction it’s going. In our joint document that we published some time ago called China 2030, it was very clear about how it’s going to change the path of growth from focusing so much on investment and export to one focused on services and consumption, and that’s actually happening. So, we’re encouraged that China has stayed on a course of this change from what they call rapid growth to more quality economic growth. And while we think that the growth rate is going to remain stable in China this year, we’re waiting to see what comes out of the Party Congress just like everyone else. But I don’t expect a major change in policy. I mean, the economic growth strategy has, I think, been made clear, and we’ve been watching as they’ve kept to the plan. MR. THEIS: Great, thank you. Shawn Donnan there in the middle with the hand up. Thank you. QUESTIONER: Thank you, Dr. Kim. The U.S. Treasury yesterday said that it wanted to see a review of the World Bank’s capital balance sheet before it engaged in a discussion about a capital increase. One of the conditions it set for that was a better or more rapid graduation of middle income countries, like China, arguing that the Bank should not be lending to China. Do you believe the Bank should be lending to China? And can you just talk us through a little bit more about why you need a capital increase and respond to the U.S. position? DR. KIM: Thanks, Shawn. We have been arguing that we need a capital increase just because of the demand we’re seeing from countries. This is not just the large middle income countries, like China; we’re seeing it from the fragile and conflict-effected countries, we’re seeing it from middle income fragile and conflict-effected states. And we also continue to get requests from our shareholders to do more in this area, and that area, and in other areas. So, the demand has just exploded for us. I think we’ve done pretty well in making the argument for why we need a capital increase. Now, the point that the U.S. made is not a point that only the U.S. is making. There is an ongoing discussion about who should qualify for loans and who should not qualify for loans, and that is actually a shareholder decision because we have to bring every loan, every project has to go to the Board, and the Board says yes or no. So, things like a capital increase are also a shareholder decision. We make the case, and then the shareholders decide whether we get one or not. The good news is the U.S. is now very much a part of the discussion. A new administration takes time to get organized. I think now the fact the U.S. is part of the discussion is really encouraging, and it shouldn’t be surprising to us that something as significant as a major capital increase for the World Bank Group would take time and everyone would want to know the details of why we were doing it or not doing it. So, I think on China for me the rationale for us working in China is quite clear. Not only are we helping them along the development path, but the lessons we learn in China, just like what we were talking about— the fact that 800 million people were lifted out of poverty— the lessons we learned by working in China are very helpful to other middle income countries. But again, this is a decision by shareholders. The shareholders together make the decisions about who qualifies, who doesn’t qualify. We will provide all the information they need, and we look forward to a very good discussion on Saturday at the Development Committee. And then, we hope to move to some sort of decision in six months. Now, I remain extremely optimistic. I mean, I think that once shareholders see how much they’re asking us to do and then look at the capital we have to actually get that done, I think, eventually, we’ll get to a capital increase. But we’re going to have to keep answering questions for at least the next six months. I think the result will end in a significant capital increase, but, again, it’s not something that management can decide on its own. MR. THEIS: Thank you. Second row there, please, in the glasses. Thank you. QUESTIONER: Good morning, Dr. Kim. I’m Surabhi from the Hindu Business Line Newspaper in New Delhi. Last week you spoke about India’s decline in growth this year as an aberration, but the World Bank has cut its GDP forecast for India for 2017 and ’18, and you’ve also spoken about weak private investment. So, what are the reforms that India can take for that? Thank you. DR. KIM: So, I think that the point that I was making is that our team feels that the slowdown has been the result of waiting for the passage of the goods and services tax. But the goods and services tax, we have to understand, is something that India has been talking for a long time, well before Prime Minister Modi took power. The goods and services tax is going to stop things like trucks being stalled for such a long time in transporting things through India because at every border they have to stop and go through a complicated tax payment process. The goods and services tax will be very good for Indian growth, but for now, the sense is that companies are waiting until that passes before really making investments and taking action. So, our sense is that this is temporary. Prime Minister Modi took a very different approach to our Doing Business report. His approach was: we are going to move up quickly and we’re going to do the things that we need to do to reform the business environment. And the actions that he’s taken are really quite substantial. So, we’ll wait to see what happens on the Doing Business report this year, but we’ve been very encouraged with the reforms that he has already taken. Now he’s know that there are more to do. I won’t be specific about them because they have prioritized them for them government, but the reform process has been significant and we think that certainly in the medium and long term, the growth will reflect the seriousness of Prime Minister Modi’s government in making those reforms. QUESTIONER: My name is Obinna Chima from Thisday Newspapers in Nigeria and The Rise TV in Africa. 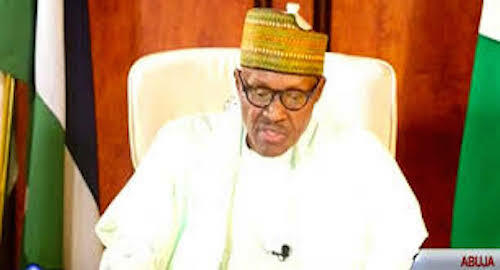 Mr. Kim, what can you tell us about Nigeria, specifically your intervention in the power sector, and also, what is the World Bank doing to support those ravaged in the northeastern part of Nigeria by the Boko Haram terrorists? Thank you. DR. KIM: You know, in my very first meeting with President Buhari he said, specifically, that he would like us to shift our focus to the northern regions of Nigeria, and we’ve done that. Now, it’s been very difficult. The work there has been very, very difficult. I think Nigeria, of course, has suffered from the drop in the oil prices. I think things are just now getting better, but the conversation we need to have with Nigeria, I think, is in many ways related to the theme that I brought to the table just this past week, which is investment in human capital. The percentage of GDP that Nigeria spends on healthcare is less than one percent. Despite the fact that there is so much turbulence in the northern part of the country and there is the hit that was taken from the drop in the oil prices, Nigeria has to think ahead. And investing in its people, investing in the things that will allow Nigeria to be a thriving, rapidly growing economy in the future is what the country has to focus on right now. It can’t rely just on oil prices going back up. It has to think: what are going to be the sources of growth in the future for Nigeria, in what will surely be a more digitalized economy? And this is true for most of Africa. If you look at the numbers in terms of how successfully African countries have invested into their human beings versus other regions, there is a real issue. And so, over this next year, not only in Nigeria but in all of Africa,we’re going to focus on accelerating investments in human beings— in human capital we call it— but investments in health, education, social protection so that Africa can prepare itself for the next phase in economic development. One of the real questions that we all have is our traditional notions of economic growth— which are agriculture, to light industry, to heavy industry— how many countries in Africa will actually experience that, and do we need to really think about another kind of path to economic growth that’s very focused on a small- to medium-enterprises and entrepreneurship as they have in other parts of the world? I think we still don’t know that. But the one thing we know, the one thing we know, is that better health outcomes, better education outcomes, will be critical no matter what the global economy looks like. So, yes focus on the north, hope that as commodity prices stabilize, oil prices come back up and the economy will grow a bit more, but very, very much focus on what the drivers of growth in the future will be. MR. THEIS: In the third row there with the hand up please, thank you. QUESTIONER: Philip Aldrick from the Times in London. The UK government is quite keen to see the rules around what qualifies for ODA changed. I just wondered if you believe that there is support or if you did support some of these potential reforms. DR. KIM: You know, it’s very related to the answer to Shawn’s question. This is an ongoing conversation on the Board of the World Bank Group. It’s true that many countries have gone from being very poor to having developed quite a bit. The UK government, rightly, is very focused on lower middle income countries. Countries that have just graduated from our fund from the poorest, IDA. There is no question that that’s the direction that our lending is going. The question that the Board will have to take up with us providing information is: what percentage of our lending will go to these different client segments? I think that the request to us to be more systematic about it, to have a strategy and to move forward in that strategy is perfectly reasonable. That’s the discussion we’ll have at the development committee, and that’s the discussion we’ll have over the next six months as we talk about a capital increase. MR. THEIS: Yes, right here with the red tie please, thank you. QUESTIONER: Thank you. Charles Ebuna from the Cameroon Radio Television. One of the key features of the African economy today the rise of startups, young entrepreneurs. I wonder what kind of support the World Bank is giving in terms of assistance to support this group of young people who are coming in. Because as you know, most governments are stressed either by wars on terrorism in the case of Cameroon, our neighbors Nigeria, Chad, because the budget is already too taken over by such crises. I don’t know if you have met President Biya of Cameroon, if yes or no, what kind of projects did you discuss in the energy sector, in particular, as you know roughly 620 million of the continent’s population are energy impoverished. DR. KIM: So, I haven’t had the privilege of meeting President Biya, but let me get to the question of entrepreneurship. So, we’re just on Saturday, we’re launching a major new effort that we worked on with the United States government and Ivanka Trump called the Women’s Entrepreneurship Financing Initiative. And in a very short period of time we were able to raise $350 million of grant based financing which will be leveraged into at least one to two billion dollars of support for women entrepreneurs. Now, this is something that we’ve done before and been very successful with at IFC. IFC has also financed small and medium enterprises and entrepreneurs in other parts of the world. This is a major issue, though, because it is very difficult for big institutions like ours to get the relatively small amounts of money that are required for small and medium enterprises. So, that’s why we’re working with companies like Alibaba. Alibaba in China has developed a system where within five seconds, literally within five seconds, they can provide loans to small and medium enterprises for up to $160,000; one million renminbi. And they do that solely based on the online activity. So, online activity for Alibaba is a better measure of credit worthiness than the traditional processes that we call KYC, Know Your Customer. So, what we’re looking at is, can we utilize some of these methods, these rapid disbursements of capital to small and medium enterprises in Africa? Right now, the answer is not yet, because we don’t have enough information on online behavior. So, Jack Ma, the CEO of Alibaba, recently visited Kenya, which is probably the one country that has the most information on people’s online behavior, 98 percent of Kenyan’s do some form of financial transactions online. So, it gets back to the question of Nigeria. I think with Africa, we have to be much more creative. We have to think: so what are going to be the drivers of growth if, in fact, light manufacturing is becoming mechanized. If 3D printing is going to make garments and shoes, what is going to happen with the light manufacturing industries? Are they going to go back to the developed countries? And then, if you don’t attract light industry what about heavy industry? So, it might be a different path altogether, and if that’s the case, again, investing in people is important. And then looking at innovative ways of moving capital, moving capital quickly and efficiently to people who are going to start promising businesses, is probably a major direction we have to go. Right now, it is still pretty slow and difficult because we’re always working with financial intermediaries, which makes things much more difficult for us. MR. THEIS: Right there in the second row in grey please. QUESTIONER: Hi, good morning. My name’s Kalilah Reynolds, Nationwide News Network in Jamaica. What’s the World Bank’s position on debt relief for Caribbean countries recently affected by these catastrophic storms back to back to back? Many of them are designated middle income countries and so they’re not eligible for concessionary financing so, what’s the position for debt relief and/or concessionary financing for these countries? DR. KIM: Well, that’s a great question and it’s a conversation that’s really happening right now. You know, our response to it has been to disburse, I think now over $40 million in relief because what we had developed was a catastrophic drawdown facility where multiple Caribbean countries together benefited from an insurance policy. And so we’ve done a lot to prepare countries for hurricanes and natural disasters, and we also have the insurance policy that disbursed automatically. But it’s not nearly enough. I mean, there’s going to be much more investment required. So, now we’re repurposing funds that had been designated for other purposes and now moving it toward rebuilding after the hurricanes. I’m not sure where the discussions’ going to go, but I think that discussion has to start right now. Jamaica, especially, has done so much in a very difficult situation to create primary surplus, and we’ve all been very impressed with how seriously Jamaica has taken, you know, its own debt issues. I think it will be a complicated conversation, but we all know that we have to step up. And, in fact, we’re doing a ministerial meeting sometime later this week, I’m not sure which day, but there will be a ministerial meeting where we talk precisely about how we’re going to rebuild the Caribbean and what we will do about things like existing debt. MR. THEIS: In the fourth row on the aisle, please. QUESTIONER: Good morning. This is Jesus Vargas, Economic News in Columbia. This is my fifth year at the October meetings. I know that you don’t need translation because you worked as a physician in the poor neighborhoods of Lima. 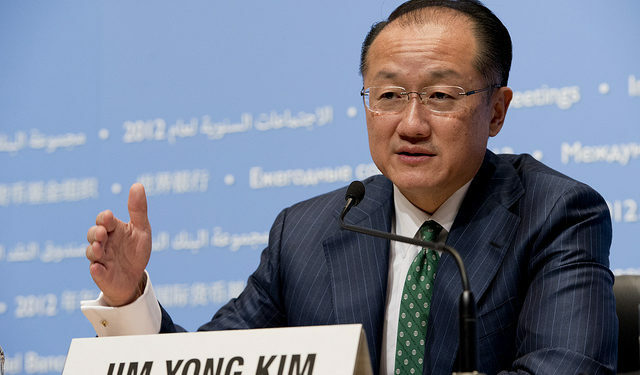 Now that the World Bank has proposed this human capital project we find it very interesting because just recently you were talking and dealing with Ebola, with refugees, and this year you have been dealing with the devastating effect of natural disasters. Could you please describe how the main credit lines of the human capital will be that has been set up by the World Bank? DR. KIM: Thank you very much for your question. So, one of the things that I asked my team is, you know, we’ve published so many papers saying that education is connected to economic growth. That healthcare is connected to economic growth. And so, the question I asked them was, well, how deeply is it connect to economic growth? What do we know about the impact on economic growth on health and education, let’s say over the past 25 years? And so, the reason we can do this project now is because, one, there’s so much more data than there was before on health outcomes, but also on educational outcomes. At the World Bank, we’re not just looking at years of education, we’re looking at learning adjusted years of education. In other words, you may have gone to school for 12 years, but effectively your test scores reveal that you’ve only gone to school for six years. Right, so, we’re looking at learning adjusted years of education. Now, if you have real outcome data and you can utilize some of the new methods, I mean, literally they’re called Bayesian Methods— it’s the kind of methods that the big data companies use to sift through data, look through relationships. It’s a very computationally intensive and complex way of looking at data. But I asked a group in the University of Washington, linked to the Gates Foundation, if they could take all the data we have on health and education. They are the best in the world at looking at differential health outcomes, and then taking our data from economic growth over the past 25 years, and then doing these very complex regressions to see what the relationship is. And the initial relationships that we saw were just stunning to us. So, if you look at the top 25 percent of countries that have improved human capital over the last 25 years, and you compare them to the bottom 25 percent of countries that have not improved human capital so well over the last 25 years, the difference in economic growth is as high as 1.25 percent of GDP per year. When we saw this data, the chief economist Paul Romer and others, we were quite surprised because these are profound connections of, you know, improving human capital and economic growth. So, we felt that it was simply our responsibility to reveal that to our member countries, and so we’re working over the next year on coming up with a ranking. And the ranking will look at two things. One part of the ranking will look at the stock of human capital. So, you know, we talk about stock and flows. It’s not just what you have now, but what your income is, what the flow of new human capital is like. So, we’re going to look both at what is the existing stock of human capital and look at the flow, meaning how quickly are countries improving their human capital. And then if you project forward, if it was that powerfully connected to economic growth over the past 25 years, in my mind, and I don’t know this for sure, but in my mind, as you look forward, that connection’s going to be even more powerful as the economy becomes more digitized, requires much, much more sophistication in a digital economy. So, we’re doing this in order to create an environment where heads of state and ministers of finance can look much more realistically at the cost of not investing in human capital and the benefits of investing in their human beings. Now, you know, Latin America, over time, has invested more in health and education, but the outcomes have not been improving fast enough. So, what we hope will happen, for example in Latin America, is that they’ll come to us and to other organizations and say, okay, so we’ve been in more but not getting the results. Can you help us be more effective in our investments in human beings? That’s what we’re really hoping for. And, for me, I think we’re really on a race with time because what will happen is if young people are, you know, stunted as children, as infants, and then don’t get the education they need, they’re going to find themselves living in an economy where they just can’t compete. And that is going to be, I worry, a source of instability, conflict, violence going forward. So, we’ve got to move on this very quickly, and so this is why we’re so committed to putting this project together, which will include rankings of both stock and flow of human capital. MR. THEIS: Thank you. In the fourth row, this woman here please. Thank you. QUESTIONER: My name is [inaudible]. I’m a journalist from Egypt. I just have a question. What do you think of the Egyptian process to reform right now, and if there are new steps to be taken to enhance the economy and make people feel satisfied? Thank you. DR. KIM: So, when I first met President el-Sisi, I think three years ago, he told me that he wanted to start a massive reform process where he would take on everything at the same time. And so, in fact, we’ll be featuring some of the reforms in Egypt in my speech tomorrow morning. One of the things they did, in 2013 when they took over, fossil fuel subsidies were 6.6 percent of GDP, and that meant that Egypt was spending more on fossil fuel subsidies then on health, education, and social protection combined. And so they went through a process of removing fossil fuel subsidies, and what that they did, is that created an extra $14 billion in the budget for other items like social protection programs, like early childhood programs. And so the reform process has already had direct benefits— growth was 4.7 percent in Egypt this past year. Now, it’s going to be critical to continue those reforms. We remain committed to Egypt in taking those reforms forward, but here’s what happened: that in removing the subsidies and in going through a number of policy reforms, financial institutions, investors came on board. Over 15 now financial investors came in, and are now investing in the Egyptian economy. And this gets at the core of what we’ve been talking about in terms of our cascade. In other words, you know, we support governments, the public-sector side of the World Bank Group supports governments to make reforms, and then the private sector side works with private investors to invest more. And what that does, eventually, is it frees up money to invest in human beings, and that’s just what Egypt is doing. Now, we continue to be deeply engaged. We have a very large portfolio. The whole portfolio is about $8 billion. But growth, stability, and reduction of inequality, better provision of social services is not just critical for Egypt, it’s critical for the entire region. Building hubs of stability in that region is a crucial part of our work going forward. MR. THEIS: Great. We have time for one more and I’ll turn to front row at the end, please. QUESTIONER: Larry Elliott of the Guardian. Talking to NGOs and civil society groups this week, but they say that the Bank talks a very good game on inequality but doesn’t always live up to its rhetoric. There’s two main criticisms. One is that the governance of the Bank is still heavily skewed in favor of rich, developed countries despite the reforms, and the second is that quite a lot of what the Bank does on the ground doesn’t actually help the fight against inequality. One example would be Bank support for private education in Liberia, which is excluding a lot of people from schools. It’s expensive. So, the real message is that you talk the talk, but don’t walk the walk. What’s your reaction to that? DR. KIM: So, you know, we have a great relationship with NGOs and CSOs, and that dialogue has shaped the World Bank over the past 20 years tremendously. We wouldn’t have the environmental and social safeguards if not for the insistence of NGOs. But we have, and continue, to play a huge role. We’re the largest financers of education in the world. We just made a $15 billion commitment to healthcare. On the issue of private education and private healthcare, you know, we are approaching this not from an ideological perspective. We’re approaching it from the perspective of: how do you improve health outcomes and educational outcomes as quickly as possible? Now we’re in the middle of preparing our own sort of guidelines and overview of when private sector intervention in health and education might make sense. But I would urge you, Larry, to take a look at the larger project, the human capital project. Why are we starting the human capital project? Because what we see is that, for example, when countries graduate from being IDA borrowers to IBRD borrowers, paying a higher interest rate, they drop all of their borrowing for health and education because they don’t think it’s worth the higher interest rate. You know, many IBRD countries will come to us and much prefer loans on roads or energy, which are important, than investing in people. So, we did a study of what are the things that have had the biggest impact on inequality, and, it turns out, of course not surprisingly, that investments in health, education, social protection are three of the most important parts of reducing inequality. Because, effectively, what we’re saying is, if you don’t start with literally the potentially pregnant women, not even the pregnant women, and make sure that her health is what it should be then people are not going to have equality of opportunity. They’re not going to have an equal chance. And so, part of my motivation for starting the human capital project is that heads of state and ministers of finance, who, by the way, are the ones who make the final decision. This is one of the things that have happened out of the NGO/CSO engagement with the World Bank. They told us that you’ve got to put countries in the lead, countries have to make the decisions. And we’ve come to see that investment in those things that reduce inequality the most is not the choice that many heads of state and ministers of finance are making, but we believe it’s because of a misunderstanding about the drivers of growth. And that’s why the human capital project is aimed at revealing to heads of state and ministers of finance just how powerful that connection is, and how, I think, how much more powerful it will be going into the future. Now, on the private sector let me just leave you with this. You know, our bottom line is that: it has to increase quality, it has to increase access, everyone should be able to afford it, the poor can’t be left out. Now, in some countries like India where a majority of health services are provided by private practitioners, you cannot talk about a reform of the Indian healthcare system without talking about a reform of the private sector. Right. So, I think, having been part of the critique 20 years ago, 50 Year is Enough, when we were all trying to close the World Bank on its 50th anniversary, the evolution has been tremendous. And please just take a look at what we’re doing with the human capital project. I think that you will see in it a much more determined effort to get at inequality. MR. THEIS: Great. Thank you all very much. DR. KIM: Thank you very much.